..... Click the link for more information. solution. The chemicals used in dips include lindane, rotenone, coumaphos, and amitraz. The vertical angle between the sensible horizon and a line to the visible horizon at sea, due to the elevation of the observer and to the convexity of the earth's surface. Also known as dip of horizon. The angle that a stratum or fault plane makes with the horizontal. Also known as angle of dip; formation dip; true dip. A pronounced depression in the land surface. Of a trap, 1 the lowest portion of the inside top surface of the channel through the trap. i. The angle between the local horizon and the lines of force of the terrestrial magnetic field. Its value is maximum near the poles. Also called a magnetic dip, magnetic latitude, or magnetic inclination. ii. 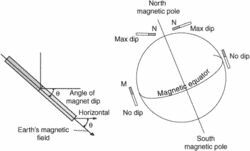 The angle between a magnetic compass-needle perfectly poised, or on the horizontal axis, and the local horizontal plane. Also called a magnetic inclination or dip angle. iii. The vertical angle between the true horizon and the apparent or visible horizon. 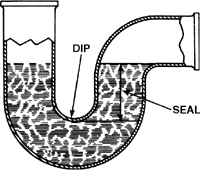 Dip is a function of the height of the eye (i.e., the vertical distance of the observer's eye from the earth's surface). iv. To dip or to lower one's wing, generally as a sign of recognition or acknowledgment. (1) See device independent pixel. (2) (Document Image Processing) See document imaging. (3) (Dual In-line Package) A common, mostly-rectangular chip housing with leads (pins) on both sides. Tiny wires bond the chip to metal leads that wind their way down into spider-like feet. The DIP is plugged into a socket or inserted into holes in the printed circuit board and soldered. See DIP switch, CDIP, CERDIP and chip package. Introduced in the 1960s, the DIP package was widely used for decades and still exists to hold microcontrollers and other electronic circuits.